South African citizens have, in recent years, often woken up to the news of a Cabinet reshuffle, mainly because the reshuffle has taken place too late for the average South African to still be awake. However, a few months ago, we stayed up for the announcement. It was President Cyril Ramaphosa’s first Cabinet announcement and despite the delay deeper into the night, many chose to stay up for it and head to work red-eye. With the reshuffle came a few surprises, as there always will be, but most would agree it was a promising start to President Ramaphosa’s presidency. However, our focus has fallen upon one of the appointments as we sat down with the newly-appointed Minister for the Public Service and Administration, Mrs Ayanda Dlodlo. Leading a portfolio that is anchored by the Department of Public Service and Administration (DPSA),which was established in 1996, the main aim is to develop and maintain norms and standards to ensure that the government functions optimally. To do this, the Ministry must retain a compliant, functioning and ethical public service through programmes, systems, frameworks and structures capable of detecting, preventing and combating corruption. The Department also contributes towards improved public administration in Africa and internationally through various platforms, where they share experiences and best practices. Through these various initiatives, the Ministry for the Public Service and Administration (MPSA) also support efforts that will ultimately result in improved service delivery—both in quality and access, as well as effective human resource management and development, sound business processes, systems, accountability, and effective public participation. “Since the establishment of the DPSA, we’ve been able to transform public service. The Department was formed at a time when we had a hugely divided South Africa. 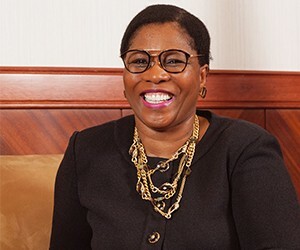 Since then, we have transformed the country into one single entity and we have been able to deliver services to people who previously had no access to them including water, electricity and the provision of all sorts of other amenities, which were not accessible before,” says Dlodlo. This is not Dlodlo’s first foray into the job at hand either—she has previously held the portfolio of Minister of Home Affairs as well as the Minister of Communications and she has served as the Deputy Minister for her current portfolio too. Like many black South Africans, Dlodlo’s history is a sad tale to tell. Not because she will tell you so—you will not find self-pity while having a conversation with her—but rather because no matter how many times you hear of the atrocities that occurred during the apartheid regime, hearing it first-hand somehow makes it hit home more strongly. A child of two students, Dlodlo was born in her grandmother’s house in South Africa’s most famous township, Soweto. Her mother, a student nurse, and her father, who was studying towards a BSc—he later branched out to obtain a teaching degree due to his passion for education—were both exceptionally persistent about the fact that their children must receive a good education. Due to the racial divide within South Africa at the time, Dlodlo’s family moved to Swaziland. This move is described by Dlodlo as “one of the best things my parents could have given me”. Her father was exiled but she could return to visit her grandparents and as a teenager, she moved back to South Africa to live with her aunt. It was at this point that she could fully understand the issues that were happening within the country and she decided to leave South Africa and join the ANC. “In joining the ANC, I was very clear that I was not going into exile forever, all I wanted to do was get my military training and come back to South Africa and help liberate my people,” says Dlodlo. Dlodlo did her military training in Angola and also did military intelligence training in Russia for some time before returning home. Fortunately for South Africa, a settlement was reached before a war broke out. Dlodlo explains that “we always knew that negotiation was a possibility, we were open to it, taking the country by force was never the only option”. However, she continues to say that during any negotiation, you must give and take, and sometimes, “you give more than you would under normal circumstances”. In South Africa at this very moment, land expropriation without compensation is high on the agenda, having passed through parliament already. Dlodlo feels that enough time has been wasted on this already and it is now time to start acting, which is exactly what has happened in recent weeks. Many headlines have been written on this topic, not only in South Africa, but also internationally. It has received much support, as well as negativity, as both sides of the coin are being examined. There are many who believe the racial divide of the past is still with us today but it is neatly hidden under the umbrella of the rainbow nation, while others use the term ‘reverse apartheid’. Regardless of which side of the fence you sit on, it is an issue that has been brewing under the surface for some time, and a discussion on the subject is required. Unfortunately, it is being used as a political tool by many and scare tactics have been rife as headline after headline appears. “It is unfortunate because it has now created fear among white people in their own land; it has created uncertainty on the economy because people see land as purely agriculture, which is obviously incorrect. “Why would people think we are so reckless that we’d bring the economy to its knees in our quest to correct the injustices of the past? The ANC that I know and grew up in is a fair and kind organisation—I am not talking about any individuals, I am talking about the organisation as a whole,” explains Dlodlo. What cannot be argued is that the imbalances our country faces need to be rectified. Millions of our very own people live in impoverished circumstances, circumstances that should be unacceptable for any South African. It is unfortunate that anything that happens in our country seems to be turned into a political tool. Because of the racial divide within our society, it is easy to turn one against another, while people forget to look at the facts and make up their own mind—one cannot take a myopic view of the land issue and turn the situation into a farmer (majority white Afrikaners) against the black population of South Africa. Dlodlo tells me in no uncertain terms, “The ANC government will not go rogue on the issue, that I can guarantee you. We have never done it before, why would we start now? “We sit in Parliament and play political games instead of just telling our people that the matter has been referred to a committee that will deal with it—we’re a constitutional democracy, we have never, nor will we ever pass legislation that prejudices South Africans,” she says. Taking the needs of government employees to heart, the DPSA is also working on a housing scheme for those workers in need through a strategic partnership with the Department of Human Settlements. Dlodlo hopes to have the housing scheme operational by the end of the year, though her Ministry faces a number of challenges. “We must ensure we have a streamlined approach. As we speak, there is no housing stock, so to address this challenge, we must work alongside the appropriate departments in the government. There is also land that is just sitting there, and it should be utilised. We have the authority to expropriate land, and we will need to use that land to develop the necessary housing stock,” she says. As the Minister for the Public Service and Administration, Dlodlo has executive authority and has her own goals she’d like to reach. “As a Ministry, I think we have often lost track of what we need to achieve, and that is not throwing a jab at my predecessors. We all come in wanting to achieve certain things but then get sidetracked by other issues—something that will no doubt happen to me. “But one of my passions is information and knowledge management, which is why I’d like to create a government portal where all the information that a citizen might need is fully available to them without having to go search for it on multiple websites,” she says. Another one of Dlodlo’s passions is the National Development Plan (NDP) 2030. As South Africans, this is something we should all be working towards—a plan that creates an equal society, but she acknowledges that in order for us to even get close to our goals, we require an education system that works. According to Dlodlo, we currently have a curriculum that focuses on bringing people into the market to look for work, while our focus should be on creating a youth that will create businesses and employment. It is not just education, as Dlodlo explains, but rather all aspects of our country. The focus needs to fall on the NDP and how we achieve those objectives. Working back from the end goal is where we should be and if our current direction does not fit in with the NDP 2030, we need to make the change. President Cyril Ramaphosa’s election as the President of the nation was widely celebrated and now is the time to deliver, so that all South Africans can look forward to a prosperous future. “First and foremost”, Dlodlo says, “there are clear deliverables that President Ramaphosa has to effect—delivering that election manifesto to the people is the most important thing right now, that is why we were voted into power. Empowering women has been a large focus the world over in more recent years and, arguably, Africa as a continent has out-performed most others. However, while Dlodlo agrees that in terms of employment in the political landscape, Africa has done “fairly well”, she explains that that is in terms of numbers, but “in Europe, you will find the women appointed in the political landscape have more staying power—once they are in, they tend to remain in their position. While here, you can be here one day and be gone the next—and be replaced by a man”. “Additionally, there is a lot more we can do when it comes to wage disparity. Female Directors-General should be earning the same. However, while my Ministry does have the power to hold the administration accountable at both a national and provincial level, our reach does not extend to the local government,” she says. While she fights for emancipation and believes all men should be fighting for the same thing, she also believes that in South Africa—and voting patterns prove it—there is still a deep underlying belief in men. “I think South Africa, across all races, is a patriarchal society. South Africans still believe in men, you see that in the workplace, you see that in the home, you see that in politics and you see that in the boardrooms, although I think that at a government level, we are ahead of the private sector,” she says. However, Dlodlo, the mother of a son, also believes that we should not forget about our men. Women’s empowerment does not have to happen at the expense of men and, unfortunately, this is how many see it. Dlodlo believes that more women should be brought into the workplace but also, we cannot say we are empowering women when they don’t hold any leadership roles. Falling under the MPSA’s mandate is also the Centre for Public Service Innovation (CPSI), the National School of Government (NSG), the Government Employees Medical Scheme (GEMS) and the Public Service Commission. The CPSI, mandated to address innovation in a public sector context through the creation and implementation of new and service delivery solutions, is responsible for investigating new systems, processes, methods, models, products or services, that allow for significant improvements in outcomes, efficiency, effectiveness and quality. “Looking ahead, I certainly think the CPSI can do more. While it was once located in the DPSA, it was taken out, the thought being that they would be able to deal with innovation more effectively. However, budget cuts have required us to once again consolidate a number of entities in order to be more cost-effective,” says Dlodlo. The MPSA, also responsible for training and development, must remain cognizant of the needs of the administration, where training must fall in line with the performance enhancement measures of service delivery. “The NSG is essentially a think tank for the government and the public sector. The school provides a training facility where employees could, for example, attend training on new legislation, new preferred procurement policies, human resource matters and tender processes. It provides a place for new graduates to gain the necessary experience, but it is also there to enhance knowledge for existing employees. “In addition, we are also responsible for GEMS, ensuring it stays afloat while catering to the well-being of civil servants. There are a variety of packages, programmes and events and we regularly test for lifestyle diseases, be it to prevent these diseases or provide effective treatment. This is not only to try to reduce the cost to the government, as the employer, but also for the benefit of the employee,” she says. The Public Service Commission, established under Section 196 of the Constitution, has a direct line with the Ministry and it reports to Parliament. While the Commission’s work does sometimes overlap with that of the DPSA, the two entities often complement each other as they work hand in hand with the development and implementation of processes and systems. “We have also finalised a new three year wage agreement. This was an imperative as our current fiscus is limping. We have an envelope but it is empty and it has become crucial for us to find more money to fill in these gaps. We have had to look at making many cuts in order to compensate employees, but we have also been very aware that we can’t take away from critical areas to do this. “So, we have turned our attention to wastage and a reorganisation of how we do things. This means streamlining processes and systems. It’s not just about cutting our human capacity but also about making our work more efficient. We are also helping with the macro configuration of the state. In South Africa, the head of government and head of state are the same person—the President—and he has to look at the state, in general, to deliver on the aspirations of his people. We play an important role in that and I hope that we’ll be done in time for the President to deliver on his promises,” she says. The DPSA also works in conjunction with two other organisations—the African Peer Review Mechanism (APRM) and the Open Government Partnership (OGP). APRM, an instrument voluntarily agreed to by AU member states, is as an African self-monitoring mechanism that aims to improve governance dynamics at the local, national and continental levels. Similarly, OGP works to secure concrete commitments from the government to promote transparency, empower citizens, fight corruption and harness new technologies to strengthen governance. OGP is overseen by a steering committee including government representatives and civil society organisations. “OGP is there to ensure that civil society remains accountable while providing good governance and public interaction. Recently, President Ramaphosa has re-appointed me as the Special Envoy on OGP and we are looking at our country action plan. I am very excited to be back in the fold and to live by the obligations set out by this partnership. There will be a summit held in July, in Georgia,” she says. “We had the privilege of chairing this summit in 2015 and we are a member of the steering committee. Our involvement with OGP attests to how we are seen through the eyes of these custodians of good governance, where we have been elected to an international board, and it is a feather in our cap,” she adds. Dlodlo also hopes to submit their APRM Second-Generation report by January 2020. This report will cover the work South Africa has committed itself too and the progress they have made so far. “The one thing we were expected to deal with was xenophobia and it’s an area where I see much room for improvement. It is something we need to talk to our people about and because these very cruel acts of aggression are unleashed on not just non-South Africans, but other Africans, I’m loathe to call it xenophobia. It is only those people who are political or economic migrants seeking asylum who are attacked and they are the people who need our help the most. While we may be signatories on committees relating to human rights, we tend to violate that responsibility with these acts of aggression,” she says. South Africa has the ability to be a great nation. The people of this nation, the majority thereof, are good people who want to see a prosperous future for the country. However, along the way, many of us have lost our way—we all have a role to play, from the government, down. There has been too much negativity regarding our country and Dlodlo confirms this, saying, “Over the last few years, I feel our country has thrived on the negativity.” But why has it come to this? Political parties—and every single one of them have been guilty at one point or another—try political point-scoring when issues arise and there seems to be a great reluctance to work together to solve any of it, at least to us as the public. What seems clear is that the NDP 2030 is where we would all like to be—a diverse society that can work as one. Being sidetracked is no longer an option.